Three-quarter length, three-quarter right side portrait of Mrs. Reiss, widow of Manchester merchant Leopold Reiss. 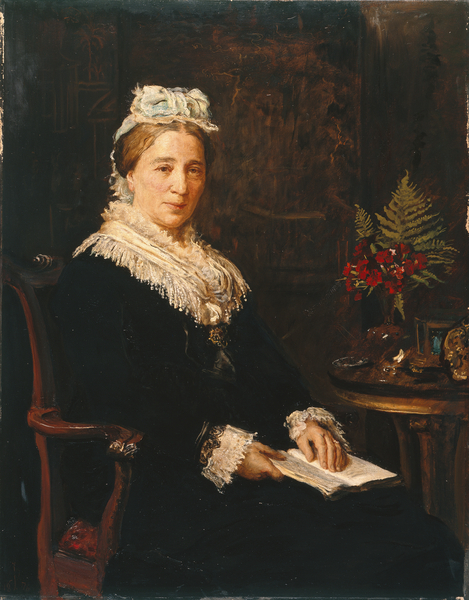 She is a well-to-do middle-aged woman wearing a dark dress with a white shawl and bonnet, sitting in a wooden armchair with a book in her lap. To the right, on a small side-table sit a vase of flowers and a number of pictures in small silver frames.